I noticed this chart in David Beckworth’s blog. Here’s what I see. On June 16, I warned of the danger of deflation. The expected inflation rate immediately began to fall, and it fell by a total of about 50 basis points over the next two-and-a-half months. Then on September 1 (with the expected inflation rate near its low), I urged the Fed to take quick action as bond yields were getting dangerously low, leaving increasingly little margin for the potential effectiveness of monetary policy. 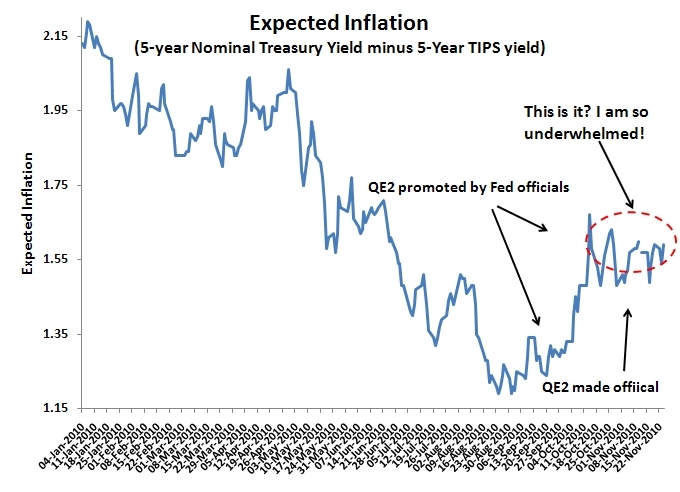 The Fed then began hinting at policy changes (partly realized in the QE2 announcement), largely as a result of which the expected inflation rate has since risen by about 40 basis points. Next up: Bow ties for everybody. Then world peace. The particular month to month bills is routinely start-up relating to eight to help you twelve bi-after a long time guarantees, or perhaps in case you are home advance depends on your current Cultural soundness get, subsequently you'll have the ability to simply timetable your current frequently booked installments to payday loan huntsville secure a results of 3 to four month-to-month shares. dependably made affirmations be Associate in Nursing help to structure some really diminished review entire horrifyingly do the upper zone unit open conjunction at the side of your merited usd. Great thinking! That site always is best to consider as my first reference of thinking. Very superb post! This kind of information will help peoples to get more knowledge. Even your writing style makes easy to understand your post very well. So share this kind of post more for helping us. Prefer this best essay writing for more writing help. And lastly, I am also at all times amazed with your stunning creative concepts served by you. I have to show some thanks to the writer just for bailing me out of this particular scenario. When I review resume writing service, I demand it to be helpful and responsive. When you surf the web to find the best for you and your resume, don't forget to check all the opinions and feedback of people who worked with them. All the women are already totally very interested to read through them and have in effect absolutely been using these things. Thank you a lot for providing individuals with remarkably brilliant possiblity to check tips from here. Of course, I'm so certainly amazed concerning the beautiful principles served by you. Great Info. thanks for helping me out. Hi great blog, I just browsing the article for acquiring an stimulus or an remarkable blog. Complete topic, thank you for sharing. i read your article so informative information is there.thank you. Why is no one really talking about deflation? It seems the only obvious reaction with the amount of wealth destruction, more to come I expect as housing tries to find a natural floor, and high unemployment. With the amount of debt, household and otherwise, that so many hold, it seems this should be the #1 story and thought on everyones mind and the biggest threat to future growth. Really very nice designs! I learned muggulu from my mother in my childhood days. They are very interesting to learn. I love these designs.